Part number IFWA-C71OZ is one ounce of our special Clear Red Hand Stamp Fluorescent Black Light Inks. 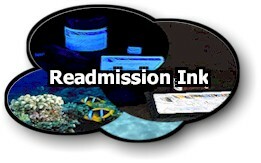 Benefits of Risk Reactor's IFWA-C71OZ Clear Red Readmission Ink:Goes on absolutely clear! Fluoresces a bright Red under long wave black light!Strong long lasting invisible ink! 1 lb DFSB-K82 Black Light Dye. 1 lb DFSB-K40 Fluorescent Ultra Violet Dye.